Tonight for dinner, I made a “fiery” five pepper baked [whole] chicken. I took two whole chickens and [using a fork] poked holes in each of them in order to let the marinade seep through to the inside. Next, I marinated the chicken with: black pepper, paprika, garlic powder, cayenne pepper, chili powder, ground mustard, a good amount of the Fiery five pepper seasoning and yogurt. .
After letting the chicken marinate for a few hours, in a preheated 375 degree oven, I baked the two whole chickens [in separate foil trays] for about an hour. I served it alongside garlic bread today. Tonight, for dinner, I made Chicken Gyros. 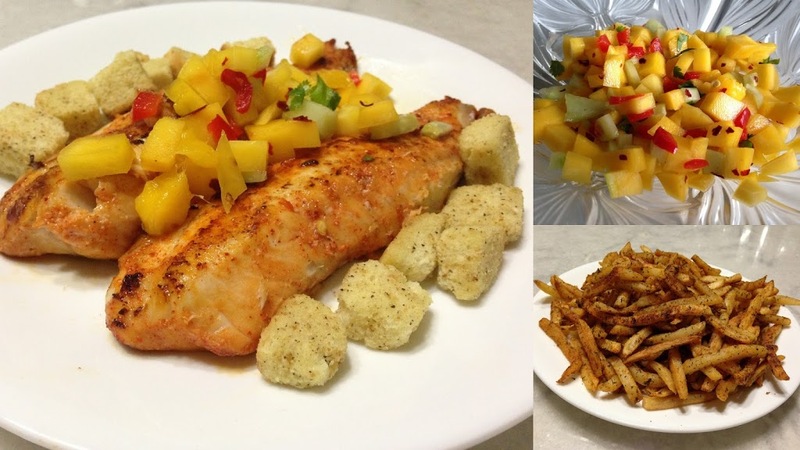 Healthy, flavorful and delicious! I took boneless chicken cubes, and marinated it with: black pepper, paprika, onion powder, garlic powder, cayenne pepper, red pepper flakes, oregano, yogurt and lemon juice. I cooked it over low heat for about an hour. In the last few minutes, I turn the heat up to high [while closely watching it] in order to let the chicken soak up any of the liquid left [that’s added flavor right there!]. After letting the chicken cool for a bit, either slice or dice the chicken. For the [tzatziki] sauce: to yogurt, I added diced cucumbers, a little black pepper and garlic powder, lemon juice, and parsley. Tzatziki sauce is what you typically find in gyros. Finally, to put it together: I took my [homemade] naan and to it I added a layer of chopped Romaine lettuce, the chicken, the sauce, and diced tomatoes on top. Wrap it like a gryo, and you are good to go! It was just my parents and I home for dinner tonight, so shrimp was the perfect thing to work with. Today, I had extra large shrimp (26-30 count) at home. A couple hours ahead of time, I marinated my shrimp with: black pepper, garlic powder, paprika, cayenne pepper, rosemary leaves, basil leaves, and lemon juice. When I was ready to assemble dinner, I skewered my marinated shrimp. I put the skewers on top of a foil tray. With my broiler on high, I put the skewers in the oven for about 2-3 minutes on each side. Note: I used the suggested 6 extra large shrimps for a serving size. Tip: Don’t forget to leave your oven door open a tad bit whenever you use the broiler. 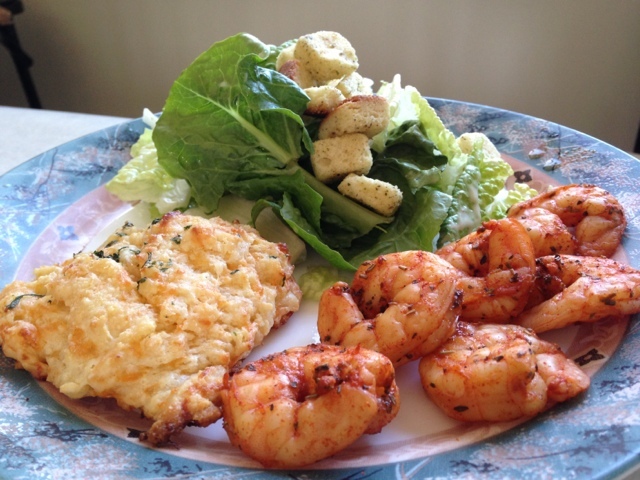 I served my [healthy] skewers of shrimp alongside my Caesar salad, and my [not so healthy] Cheddar Bay Biscuits. Click here to browse through other suggestions for sides. The original plan yesterday, was to make the whole chicken(s) like I normally do: I cook on the stove-top over low heat over a period of three to four hours [like the one pictured here]. I’m working on writing up how I make that one too [and hopefully the spinach-cheese swirls soon as well]! That chicken? It’s succulent, tender, and oh so good! Not to mention, healthy too. Don’t worry, this version is healthy too! Yesterday, I was out all day, and didn’t have time to marinate the chicken beforehand… and certainly didn’t have the three to four hours to cook the chicken the way I wanted. I marinated the chicken with: black pepper, garlic powder, ginger, paprika, cayenne pepper, chili powder, basil, parsley, red pepper flakes, and several heaping tablespoons of low-fat yogurt. Make sure to get some of the marinade in the cavity too! Next, I poked holes in the chicken with a fork. In a preheated 375 degree oven, I baked it for a total of one hour. Originally for 40 minutes, then I turned each of the chickens over, and put it back in for at least another 20 minutes. It turned out nice, but with the little (absolutely none) marinating time, the marinade wasn’t able to seep inside like I would have liked. All’s well though- the end result was still delicious. 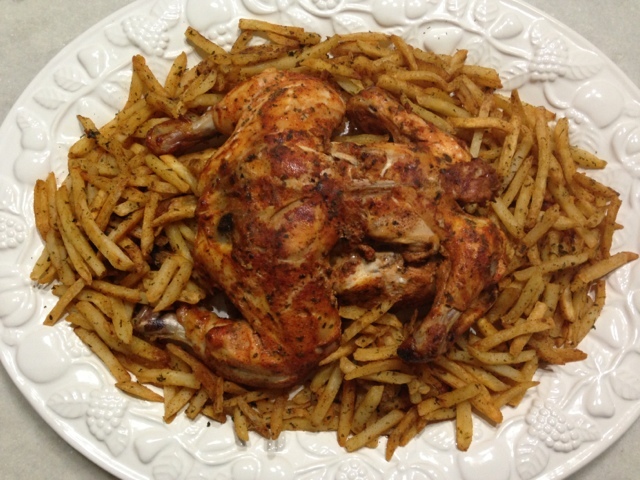 I served it alongside my baked seasoned fries [which I do often as a side… so much better than boring old fries] and garlic bread. Tip: I was working with two whole chickens, and I put each in a separate pan for my convenience. They were just so much easier to handle that way. For my parents’ anniversary tonight, I made Chicken Kebab over “Kabuli” Rice with white sauce because that’s what my mom requested (it’s one of her favorites when we go out to eat). I also made a Cheesecake with a Chocolate Center/Filling last night. I made the Chicken Kebab portion of the meal very similar to how I made my chicken skewers from here. This time, I marinated boneless chicken cubes [yesterday] with: salt, pepper, paprika, garlic powder, ginger powder, cayenne pepper, onion powder, yogurt, and some lemon juice. Next, I added in some food coloring [which is something I never do!] to get that color. I broiled my chicken, once again, today after skewering them. I had three pounds of boneless chicken cubes and that gave me exactly two batches of five skewers with six chicken cubes each]. With your broiler on high, put your chicken in for fifteen minutes. At that point, take it out… flip them over [this part is not fun… they refuse to stay usually] and put back under the broiler for another ten minutes. The thickness of the cubes was, of course, much different than using the thin boneless chicken breast fillets that I normally tend to use for skewers, but I wanted to use cubes today as that is how the chicken kebabs are typically served over the “Kabuli rice” my mom wanted. For the Kabuli rice, I just made it up. I use the term “Kabuli rice” very loosely because I have no idea how to make it, and when I Googled it… it just seemed unnecessarily complicated. So that, obviously, wasn’t going to happen. What I did, instead, was: use one part brown rice to two part water with a dash of salt and let it come to a boil on high. At that point, turn the heat to low, and let it simmer until the water is absorbed [took 35 minutes for me]. Fluff your rice with a fork, and add shredded carrots, slivered almonds, and raisins. Mix gently. When I was plating it, I sprinkled more carrots, almonds and raisins on top… for presentation purposes. It’s a fairly healthy meal, with the exception of the [reduced-fat] mayonnaise in the sauce. For the white sauce: again, I have no idea what’s in the real one or how it’s made. What I did to make mine was: mix one part mayonnaise to two parts yogurt. Then, I added salt, [a good amount of] black pepper, garlic powder, a dash of cayenne pepper, a little onion powder, a splash of apple cider vinegar, and a little lemon juice. I thought it turned out just like the white sauce served at restaurants. The end result? very similar to the components at a local restaurant. 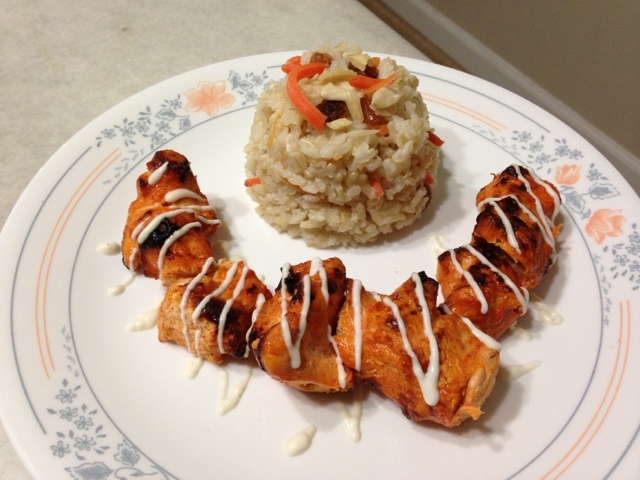 Tip: I used a squeeze bottle to get a nice and thin layer of sauce over the rice and chicken before serving. These homemade [and baked!] chicken tenders couldn’t be easier to make. I quickly made these for lunch today, and my family loved them. I took cube boneless chicken breasts and cut them into even, thin pieces [for uniformed cooking time]. Line your baking tray with foil, and spray non-stick cooking spray on the foil. 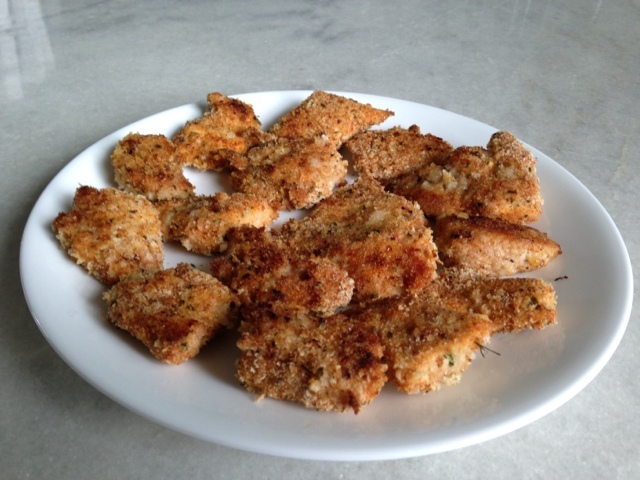 Coat the chicken pieces with a combination of seasoned panko and Italian-seasoned breadcrumbs. Transfer them onto your foil tray. Once your chicken nuggets are all on your baking tray, spray a nice layer of non-stick cooking spray on top. In a preheated 425 degree oven, bake for the nuggets for 10 minutes. Next, flip them each over, and bake for another 6 minutes. Serve with ketchup, or your favorite sauce…. and my [also baked] seasoned fries, of course! 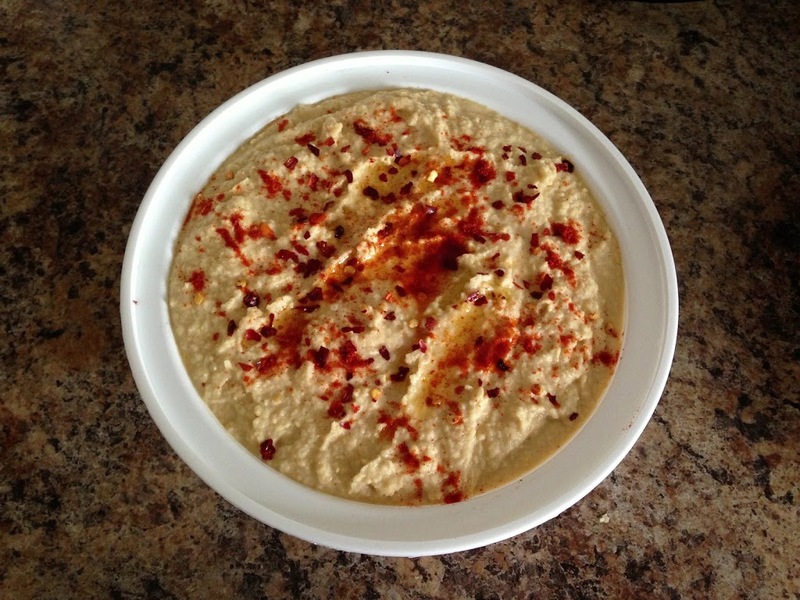 I love Hummus, and have been wanting to make my own for a long time now. For some reason, it seemed like a daunting task. In a bind, and having a hard time figuring out what to make, I made this as an appetizer for the Superbowl this year, alongside my Blackberry Crumble Bars. It couldn’t be easier to make, and it’s so quick too! Literally, just a few minutes. Healthy, delicious, and easy to transport. Pulse until the mixture is smooth, scraping down the sides of your food processor as it is needed. 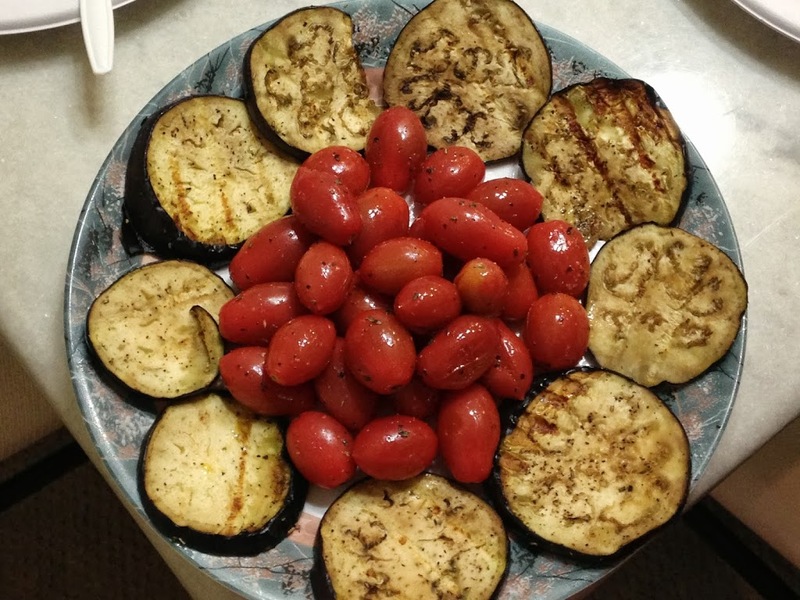 Optional: I sprinkled mine with red pepper flakes and paprika on top, and then drizzled a little more olive oil on top for presentation purposes.